While my son was searching for some games in a second hand store in Dusseldorf, I noticed a box with second hand DVD’s. I rarely buy DVD’s, because I rarely watch movies, but there are about 30 movies that I like very much and that I wouldn’t mind buying for the prices they asked in that particular shop. (It was in the Nordstrasse. 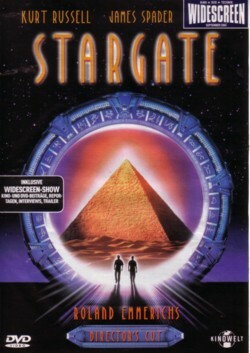 )To my surprise I found two DVD’s that are high on my virtual list: ”Stargate” and “Tirteenth floor” . Both movies are about ideas and themes that fascinate me and many other people. Actually, they do more than fascinate people, they drive them nuts. I have read many books, articles and websites by people who cannot separate truth from fiction: in their mind aspects from Hollywood movies are woven into their view on life, resulting in bizarre conspiracy theories. I would love to write a book about all this, but my take on all this is a pretty weird and complex idea in itself, that will not be easy put into words. There are certain elements in some movies that have played a major part in much of the art produced on this planet. If you can think away the images in the movies and just think of the ideas that are underlying these images, I think you can get a very small glimpse of our future. One such element is the creation of an artificial reality. I think that we will not stop until we have done that, and I can very well imagine that some of us have already done it. I mean, I can very well imagine that our present reality is an artificial creation, made by our ancestors. Or our descendants, who have managed to find a way to time travel. There is no way to prove such theories wrong, and in science that is considered a hard indication that it is plain nonsense. Basically I think that the future is beyond our imagination. As Terence McKenna said: ”It is not only stranger than we suppose, it is stranger than we can suppose.” . We overrate our abilities to predict the future. I have not yet met one person who could predict what he or she was going to say next while he or she was talking, so predicting something complex as the future of the whole planet seems a bit ridiculous to me. 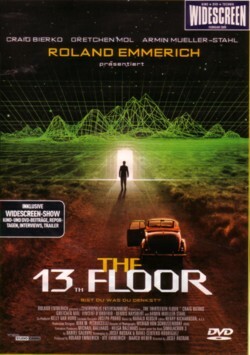 You probably know “Stargate” , but there is change that you have not heard of “13th floor” yet. It is a variation on the theme on which ”Matrix” is based. My favourite scene is the scene that is also used on the cover: a guy sees the end of the world, but in a very different way than it is usually interepreted. Here is “I am the world” by Mortiis, from the album “The Stargate” . I just got that on a sampler CDr, and I have not yet tried to find out what or who this is. I hope that it is available on a CD with more of such tracks, and if so, I will tell you where you can get it next time.